Arrondissement #1, or Louvre as it’s called, is the most sparsely populated because it holds most of the city’s historical sights – the Louvre, The Royal Palace, Tuileries Gardens and Vendôme Square. Arrondissement #2, or Bourse, is mostly business. The former stock exchange and the historic National Library are in this area . . . the smallest of all neighborhoods. Lots of shopping arcades here. Arrondissement #3, often called Temple, is also small. The National Conservatory of Arts & Crafts plus the Picasso Museum are also located here. Arrondissement #4, or Hôtel-de-Ville, holds the Notre Dame Cathedral, City Hall, and the modern Centre Pompidou. Arrondissement #5, named Panthéon, but most often referred to as the Latin Quarter, holds the Sorbonne University and the Boulevard St-Michel. Arrondissement #6, or Luxembourg, is home to one of the world’s greatest parks, the Jardin du Luxembourg. The oldest abbey in Paris also rests in the 6th. Arrondissement #7, the exclusive Palais-Bourbon, holds the Eiffel Tower, Napoleon’s Tomb and several museums including the Musée d’Orsay. Thousands of tourists, needless to say. Arrondissement #8, or Élysées, is loaded with tourist attractions. The Champs-Élysées (probably the world’s most famous boulevard), the Arc de Triomphe and Grand Palais. Arrondissement #9, or Opéra, is known for its spicy red-light district, Pigalle and the Moulin Rouge. Arrondissement #10, or Enclos-St-Laurent, holds both of Paris main railway stations, the Gare de l’Est and Gare du Nord. Arrondissement #11, or Popincourt, is mostly residential so it’s very low profile. Arrondissement #12, or Reuilly, is Paris’ largest neighborhood. Largely residential, this arrondissement holds the 2400+ acre park, the Bois de Vincennes. 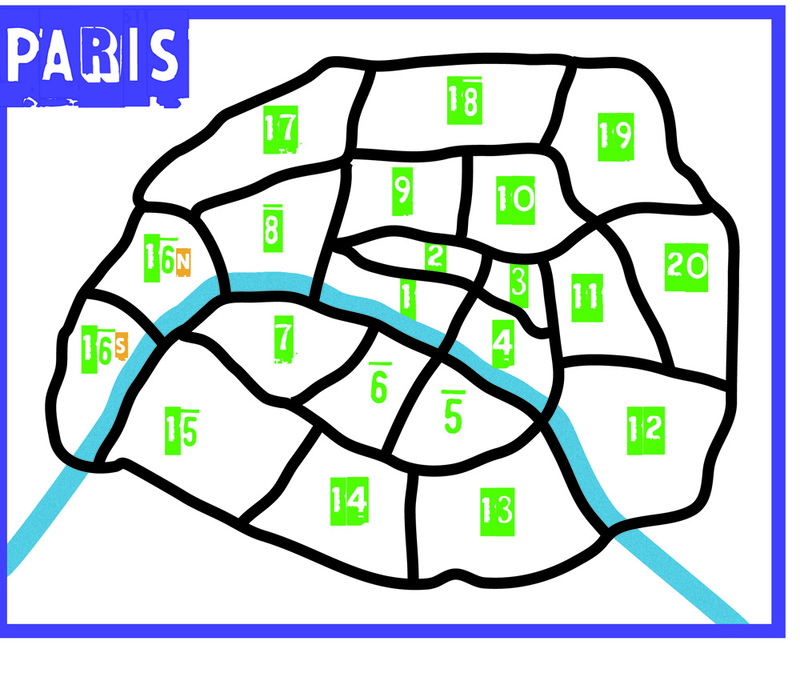 Arrondissement #13, or Gobelins, is also mostly residential. Paris’ largest Chinatown is located in this arrondissement. Arrondissement #14, or Observatoire, is a lively neighborhood historically linked to great artists and writers like Hemingway and Jean-Paul Sartre. The cemetery where many famous French citizens are buried, Montparnasse, is located here. The Catacombs can be accessed from here – at the Denfert-Rochereau Square. Arrondissement #15, or Vaugirard, is the largest of the 20, both in size and population. Paris’ tallest skyscraper, Tour Maine Montparnasse, is here. Arrondissement #16, or Passy, is considered the richest. It borders the Boulogne, an enormous park. 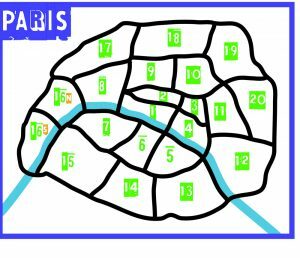 Arrondissement #17, or Batignolles-Monceau, is the one deemed ‘diverse.’ It borders the infamous Pigalle ‘hood to the north and houses a large convention center in the west. Arrondissement #18. Then there’s Butte-Montmartre, which surrounds the Sacré-Coeur basilica. In this neighborhood is also the Place du Tertre plus it borders the 9th’s Moulin Rouge. Arrondissement #19. Next is the Buttes-Chaumont with two great parks, the Parc de las Villete and Paris’ most interesting, the Parc des Buttes-Chaumont. Arrondissement #20. And finally, the Ménilmontant. Mostly residential, cosmopolitan, and quiet. Paris’ most famous cemetery, Cimetière du Père-Lachaise. For those of you who followed my walks through Manhattan, you know that I look for the unusual. There is plenty written about the tourist attractions so I look forward to finding the ‘real life’ in Paris. If you know of any such places, events or other info, please leave me notes below in the comment box. Merci! Just go see St. Chappelle if you’re seeing just one thing. It is so visually arresting that you’ll really enjoy it as a person and an artiste! Go to 2nd floor please.